MatDescriptionlib is one of the most popular visualization libraries used by data analysts and data scientists working in Python, but can often be intimidating to use. This course serves to make working with MatDescriptionlib easy and simple. This course will focus on making MatDescriptionlib accessible and easily understandable to a Data Scientist or Business Analyst who needs to quickly and visually come to grips with relationships in a large dataset. 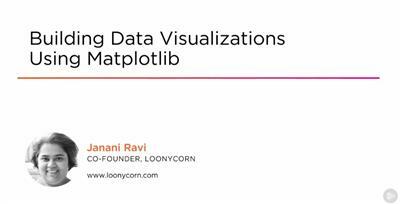 In this course, Building Data Visualizations Using MatDescriptionlib, you'll discover the basic components which make up a Description and see how you can tweak parameters and attributes to have the visualizations customized to exactly how you want it. First, you'll grow to understand the basic APIs available in MatDescriptionlib and where they are used and learn how to customize the display, colors, and other attributes of these Descriptions which will have multiple axes. Next, you'll build intermediate and advanced Descriptions, drawing shapes and Bezier curves, using text and annotations to highlight Description elements, and normalizing the scales that are used on the x and y-axis. Lastly, you'll use some real-world data to visualize statistical data such as mean, median mode, and outliers, cover box Descriptions, violin Descriptions, histograms, pie charts, stem and stack Descriptions and autocorrelations graphs. By the end of this course you'll not only have explored all the nitty gritty that MatDescriptionlib has to offer; but you'll also be capable of building production-ready visuals to embed with your UI or to display within reports and presentations.